Eduardo’s work is inspired by the most interesting of subject matter: people! And a love for painting that brings together the wonderful effects of light, color, and design to create a unique statement about the subject. Eduardo’s accomplishments include a public commission from the Capitol Foundation to paint the official portrait of Oregon Governor Ted Kulongoski. Eduardo was also commissioned by the Oregon Department of Veterans Affairs to commemorate Medal of Honor Recipient Lt. Cl. Stan Adams and his wife, Jean, for the community center named in their honor at the Dalles Veterans Home. Just as fulfilling for Eduardo are private commissions and paintings of friends and family. Eduardo is the past recipient of a grant from the Celebration Foundation, which supports Oregon artists based on their creative vision. In 2013 the University Club in Portland selected Eduardo as their Artist-in-Residence. Eduardo has exhibited in several venues in the Northwest. 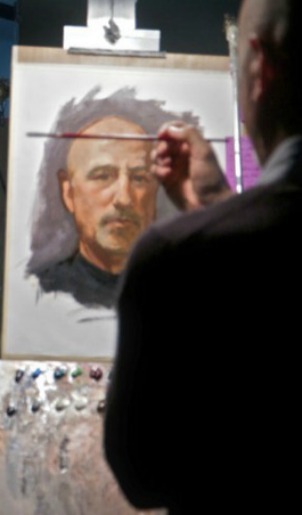 He also enjoys teaching and, in addition to MAC, has taught at the Portland Art Museum and given private instruction. Eduardo is happily married to his wife, Alice; they live in the Alberta neighborhood in NE Portland with their cat Vinnie.